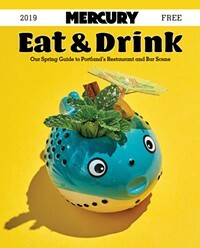 Looks like Trader Vic's is coming back to Portland. You know Trader Vic's, the place in Oakland where Vic Bergeron invented the Mai Tai (or was that Don the Beachcomber?) and served all those umbrella-laden scorpion bowls to all those post-WWII families! Like most people I know, I wasn't here to see Portland's Trader Vic's in the Benson Hotel (where El Gaucho currently lives), which was there from 1959-1996, but this picture postcard makes it look beautiful, right? Well—long rumored, then totally true, but now officially official with a press release—Portland's sees the return of Trader Vic's in mid-June (just in time for Portland's Tiki Kon). It's setting up shop at 1203 NW Glisan in the Pearl. According to the PR, "The restaurant's Polynesian décor evokes visions of paradise. The new Portland location will showcase tribal masks, tiki carvings, tapa cloth and woven grass wall coverings as well as other indigenous art and artifacts collected by the Bergeron family over the past 75 years." Granted it won't have the grandeur of the waterfront Emeryville, California location being in our landlocked Pearl District, but I, for one, won't puu-puu this good news (AURGH, I can't help myself).